Start the new year off with a bang by summiting Agassiz Peak. At 12,360 feet, Agassiz is the second highest point in Arizona after Humphreys Peak. You might be asking: “Why would I hike the state’s second highest peak?” For one, it’s a rare opportunity. The 6-mile round-trip journey is legally accessible only when snow covers the ground – aka winter – a rule enforced to prevent hikers from trampling the fragile ecosystem. Second, it’s challenging. There’s no clear trail, and the trek requires snowshoes. Finally, the rewards are once-in-a-lifetime. 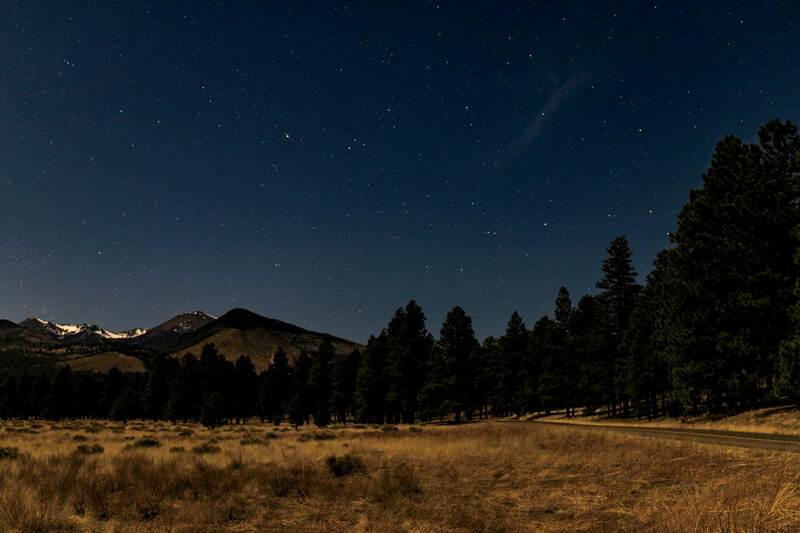 You’ll be witness to views of the San Francisco Peaks wild backcountry. Suggested Souvenir: Go with something practical, like a pair of cold-weather gloves, or something fun, like a hip Arizona Snowbowl hoodie, both at the Agassiz Lodge Retail Store. If You Go: From Agassiz Lodge (9500 N. Snowbowl Rd.) 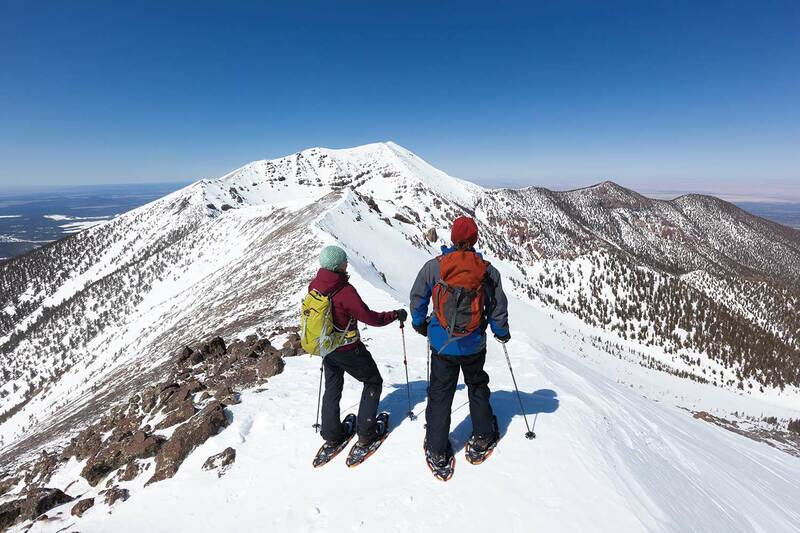 at Arizona Snowbowl, hike the west ridge up to Agassiz Peak. It’s steep, but it’s also the most direct and safest route. First, make sure to track storm accumulations at Arizona Snowbowl (snowbowl.ski) and obtain a free Kachina Peaks Wilderness Permit (928-526-0866, fs.usda.gov). We’re lucky to have several official “dark cities” in Arizona, including Sedona, Flagstaff and Fountain Hills (yep, just made the list in 2018). Each offers optimal stargazing, but if you’re anything like us, you don’t know your galaxies from your star clusters. No worries, cosmic neophytes. 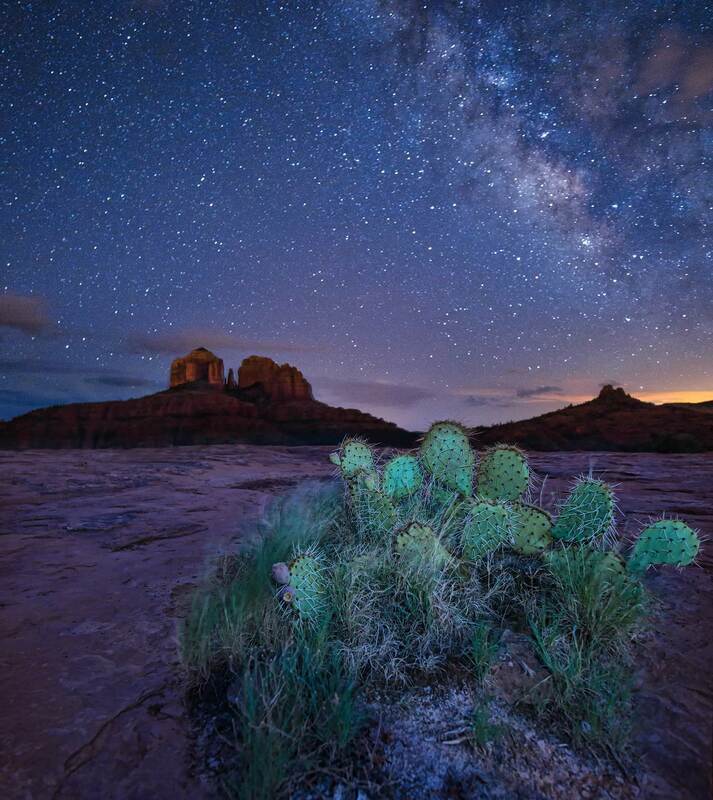 The New York Times-lauded Evening Sky Tours offers 90-minute guided star tours at sites just outside Sedona. Using state-of-the-art telescopes, professional astronomers point out celestial sights, from constellations to planets and double stars. Blankets and chairs provided. Suggested Souvenir: The colorful swirls of an agate slice seem reminiscent of otherworldly planets and far-flung galaxies. Pick up one ($24-$69) at Sedona Crystal Vortex to commemorate your stargazing. Fees: Tours begin at 7:30 p.m. and cost $70 per adult, $40 for children ages 6 to 12. 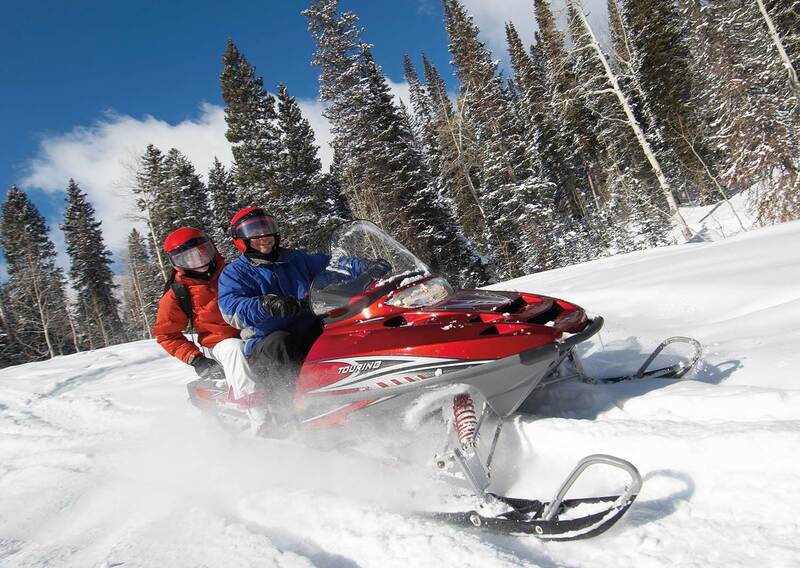 Mormon Lake Lodge not only offers cozy cabins for an ideal winter retreat, but a snowmobile trek through a 60-mile winter wonderland. Their experienced guides will whisk you through the snow-covered ponderosa pine forest, past the extinct volcano of Mormon Mountain and around Mormon Lake. Keep your eyes peeled for four-legged spectators such as elk, deer, squirrels and coyotes. Fun Fact: Discovered by Mormon settlers who arrived in the 1870s, Mormon Lake holds the distinction of being the largest natural lake in Arizona – when we’re not in a drought, that is. UNESCO-approved Marana Gastronomy Tours are ideal for epicureans. 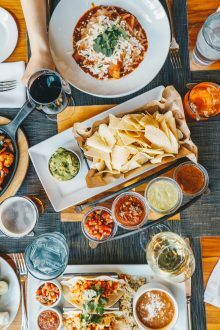 The main tour takes you on a half-day journey to ancient archaeological sites and offers exclusive tastings of Sonoran foods, such as mesquite agave or Sonoran wheat berries. 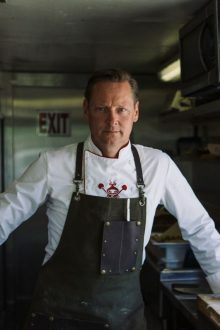 The second tour (“A Taste of the Wild”) embarks on a half-day foraging walkabout, introducing the unique flavors (prickly pear juice and barrel cactus seeds) that inspire our state’s food and drink makers. 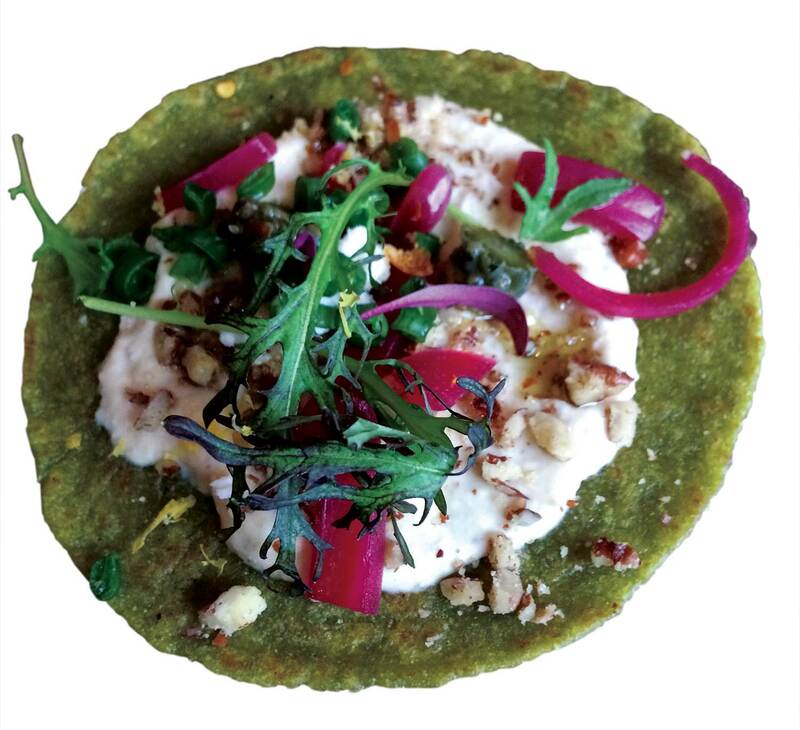 Suggested Souvenir: Your tour concludes with a chef-crafted meal at The Ritz-Carlton, Dove Mountain. Stop by the resort’s shop to take home desert-inspired treats ($2-$7), such as prickly pear popcorn or saguaro-shaped candies. By spirits, we mean the apparitions that may or may not inhabit a once-thriving mining community turned dusty ghost town. Cleator sits at the base of the Bradshaw Mountains about 45 miles north of Phoenix, and it’s the kind of place you have to want to find. All that dots the land are a few ramshackle buildings, a general store and the town’s ironically named main draw, Cleator Bar & Yacht Club. At this wood-planked saloon with old boats and Jet Skis littered out back, you can raise a brewski to the past – just don’t be picky about the beer selection. Fun Fact: Established in 1864 as Turkey Creek, Cleator became Cleator in 1925 when a dude bought the town and renamed it after himself. Way to be a boss, James P. Cleator. Fees: Just the cost of a beer. Looking for a Valentine’s Day surprise that’s sure to, well, surprise? At Canyon Ranch, the luxe retreat frequented by Hollywood-fleeing celebs, book the Watsu Massage for you and your sweetie. This gentle “floating” massage in a warm-water pool is so relaxing that people often drift into a deep, dreamlike state during the 50-minute experience. The buoyancy of the salt water allows for a freeing weightlessness, while the soothing rocking motion calms the nervous system. Suggested Souvenir: Canyon Ranch’s fair-trade, certified organic, cold-pressed Conscious Coconut oil ($19) is a perfect take-home skin lotion or massage oil. Learn the differences between a violin and a fiddle (spoiler: there are none!) at the annual Old Time Fiddlers Contest. What does nearly a half-century of fiddle competitions entail? 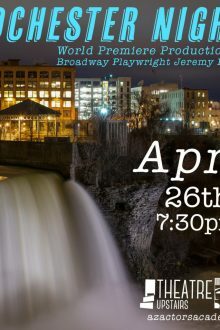 You’ve got to see – and hear – it to find out. At the Ajo Country Club, join fiddlers and fans for a weekend of music, including competitions for fiddlers of all ages, a concert in the Ajo Plaza, dances, food and a joyful singalong. Suggested Souvenir: The Ajo Visitors Center (1 W. Plaza St.) is located inside of the town’s historic train depot. Pop in to browse the shop, learn the history of the area and get your very own “Ajo” baseball hat ($18). 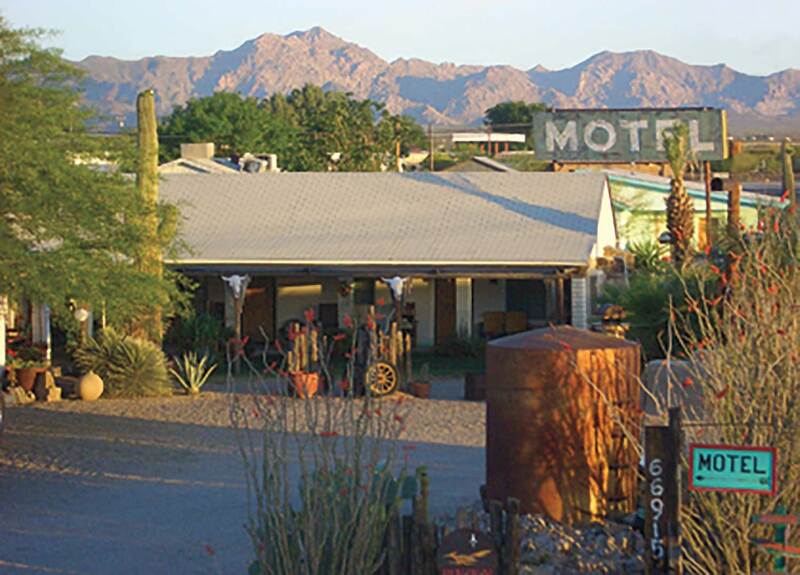 There ain’t much happening in the stark strip of Sonoran Desert between Wickenburg and Quartzsite – except this restored 1940s gem of a motel. Encircled by the Harquahala and Harcuvar Mountain ranges, its Southwestern-eclectic style shows up in the adobe walls and string lights connecting palm trees in the courtyard. The Westward cultivates rustic peace and quiet, with gas fireplaces in each room and horizon-reaching views. Bring a book or a journal and sit on the veranda and ruminate. Suggested Souvenir: We’re thinking you need a handmade birdhouse (prices vary) from nearby Lucinda’s Flowers, Gifts and Nursery. Teetering on a ridge at 6,000 feet in the Cerbat Mountains, high above the old mining town of Chloride, sit two perfect woodland campgrounds: Packsaddle and Windy Point. Located just 2 miles apart, the year-round campsites treat overnighters to spectacular views of the surrounding valley and mountain ranges – ideal for campers seeking remote isolation where they can snuggle by the fire while tucked amid pinyon-juniper scrub. Sites offer grills, fire rings, picnic tables and vault toilets. Bring your own firewood. 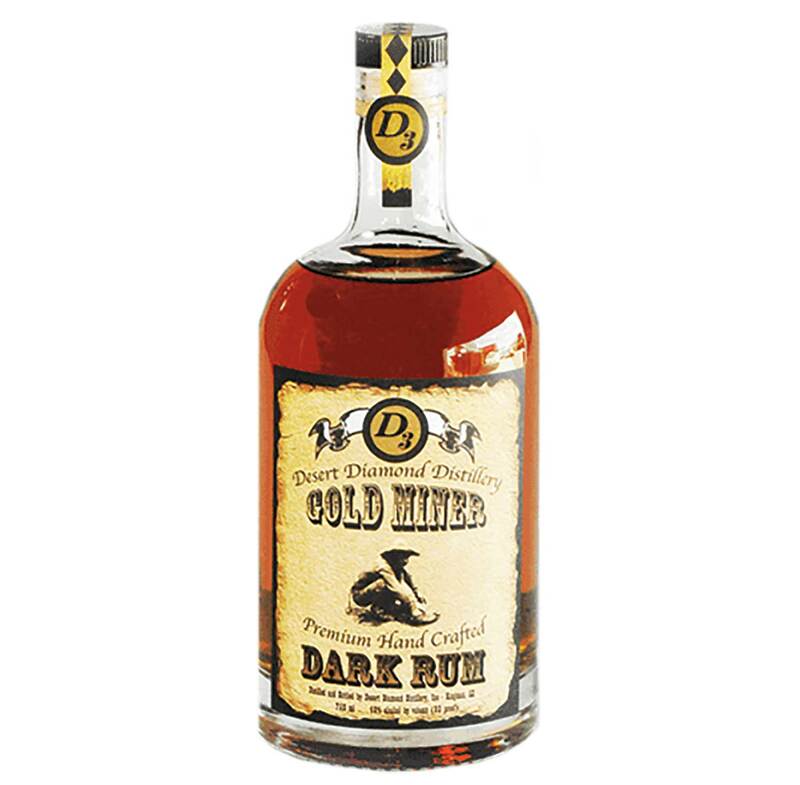 Suggested Souvenir: Keep warm by the campfire with locally made rum. Buy the Taster Set ($14.50) from Desert Diamond Distillery in Kingman (4875 Olympic Dr.); you get four 50ml bottles of their spirits. If you’re going to hike the Chiricahua Mountains, go big or go home. Famous for volcanic rock formations eroded into towers and pinnacles – known as hoodoos – the southeastern range also boasts streams, shady canyons, and in the spring, blooms of wildflowers. 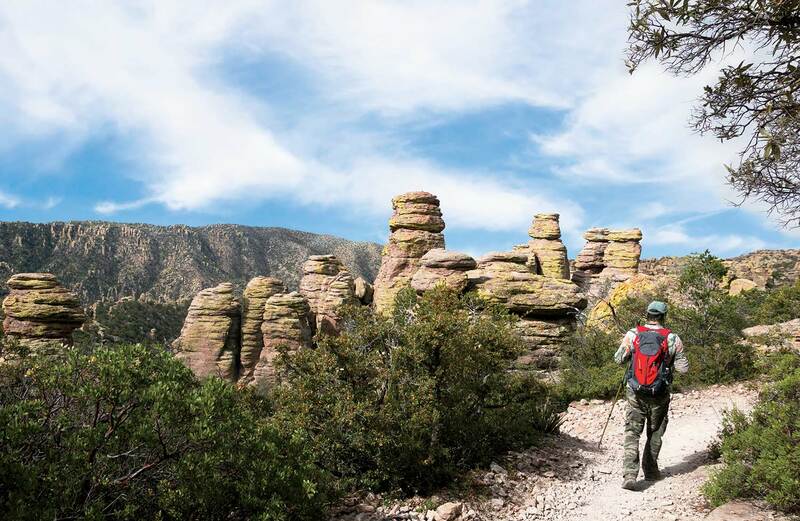 The Big Loop is a 9.5-mile hiking trail that weaves through the best scenery the Chiricahuas have to offer. Plus, it intertwines with eight other trails, so you really get to do, and see, it all. Photo opps: Snap pics of the hoodoos, of course, but also be on the lookout for wildlife such as white-tailed deer, ocelots, armadillo, jaguars, mountain lions and more than 350 bird species. If You Go: Starting from the Echo Canyon parking lot (East Bonita Canyon Drive), turn right onto Echo Canyon Trail. After a short hike into Echo Canyon, connect to the Upper and Lower Rhyolite trails. Take the Sarah Deming Trail, a 1.6-mile climb that transitions to the Heart of Rocks Loop. Follow the trail until you connect with the Big Balanced Rock Trail, then link up with Mushroom Rock Trail. As they say at Disneyland’s Big Thunder Mountain Railroad attraction, welcome to the “wildest ride in the wilderness.” Except we’re in Arizona, not Anaheim. Just outside of Kingman, Old Route 66 snakes along narrow hairpin turns and alongside vertical cliffs. This thrilling passage to Oatman demands that you slow down and enjoy the scenery, since it’s physically impossible to drive faster than 15 miles an hour around the tight curves. Once you hit Sitgreaves Pass, pull over on the right side of the road for breathtaking photo ops of the valley below. 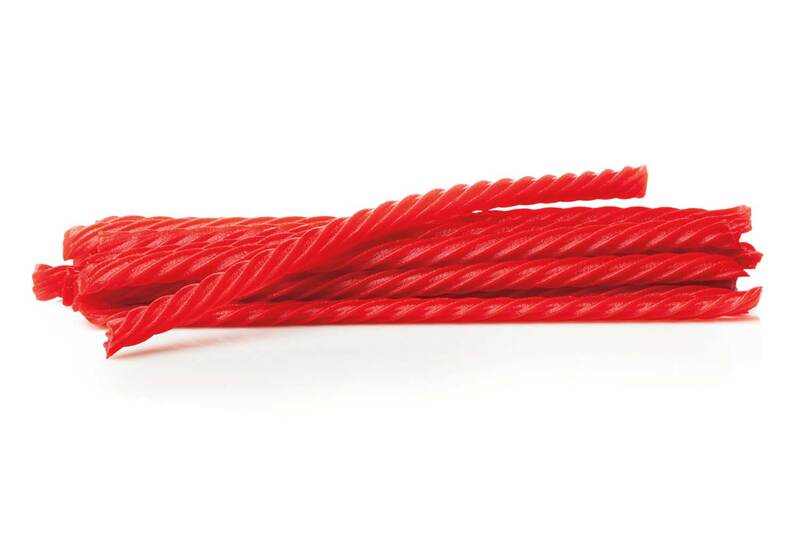 Suggested Souvenir: Sweets for the drive home. You’ll find jawbreakers, licorice, chocolates, taffy and more ($8.99 per pound) at Gold Rush Candy Shoppe in Oatman. If You Go: From Kingman, travel west on I-40, take Exit 44 and head north to Oatman. Have you ever daydreamed about dressing in period costume and bringing important moments in Arizona history to life? Failing that, do you like meeting new people and showing off our state’s lands? 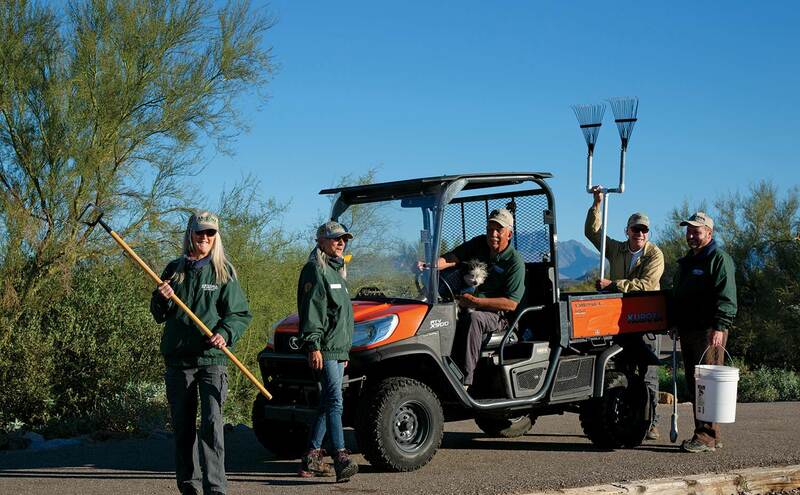 No matter your interest, there’s a volunteer opportunity for you at Arizona State Parks, from historical re-enactors to archaeological gofers. You also get to soak up Arizona’s beautiful wild lands. Suggested Souvenir: An annual State Parks Pass ($75 for the standard pass, $200 for the premium pass) is the gift that keeps on giving. The pass grants year-round access for you and three adults to Arizona’s mountains, lakes, parks and arboretums. Fees: No cost – just your time! Recently named one of the best spots in the U.S. for year-round rock climbing by Men’s Journal thanks to solid granite, plenty of crags and near-perfect weather, Mount Lemmon’s 9,157-foot summit offers a variety of routes. 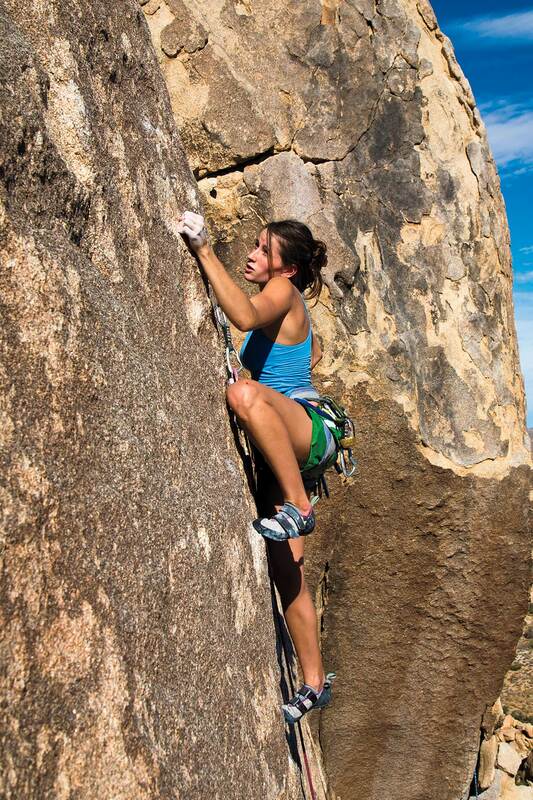 Whether you’re an expert or a novice, hiring the guiding services of Arizona Climbing and Adventure School is the way to go. The company offers private guiding and climbing courses with fully certified climbing instructors. The private guiding sessions can be booked seven days a week and are built around your schedule, plus they’re tailored to your ability and what you want to get out of the session. Suggested Souvenir: The town of Summerhaven perches on the top of Mount Lemmon, and at The Living Rainbow shop you can buy a beads-and-bells windchime (starting at $25). 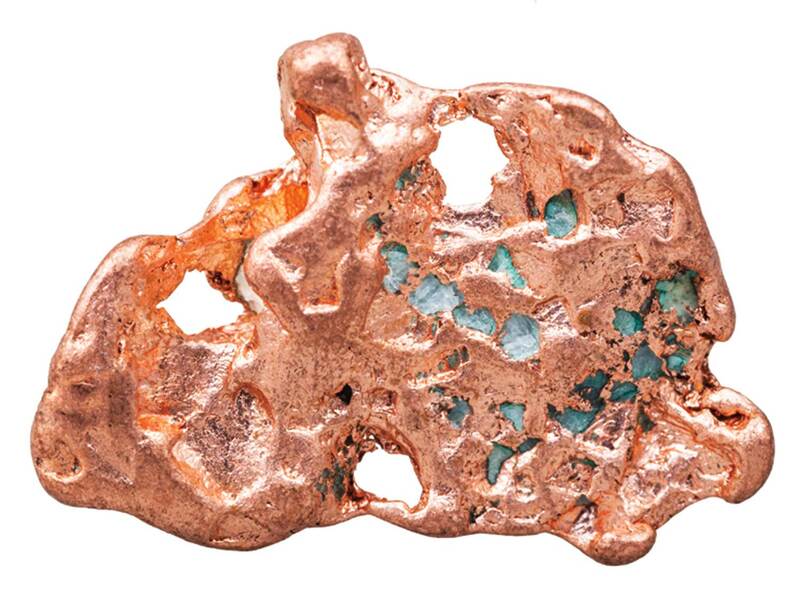 Copper is kind of a big deal to us Arizonans: It’s shaped our past and defined our present. And the Arizona Copper Art Museum is the state’s – and the country’s – only comprehensive collection entirely dedicated to copper. With more than 5,000 artifacts and art pieces that span thousands of years, the museum shows the versatility and durability of one of the earth’s most precious metals. After all, what else can serve the dual purposes of military weaponry and stylish drinkware? Clarkdale itself is worth exploring after you tour the museum; the small town has 387 homes on the National Register of Historic Places. Suggested Souvenir: Visit the museum’s gift shop in Jerome to find jewelry like a collar necklace ($100) or a Navajo copper bracelet ($35). You’ve seen the billboards. Perhaps you caught its NBC television special. “It” is The Thing, the pièce de résistance in a series of odd exhibits set in a lone, dilapidated desert museum. Purportedly, it contains two mummified bodies from the 1800s, likely murdered by cowboy bandits. 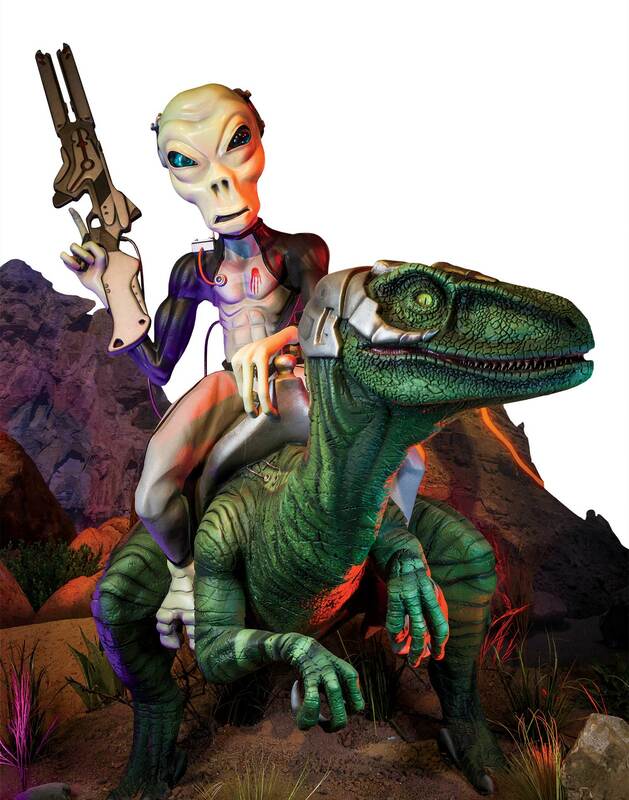 Since opening more than 50 years ago, the museum has been little more than a collection of sheds, but the owners recently unveiled a modern building with new displays, including many that link aliens and dinosaurs to popular conspiracy theories. Suggested Souvenir: Where to start? The Bowlin Travel Center is a veritable mall of souvenirs, from authentic Mexican and Native American art to alien-themed T-shirts and travel mugs. There’s no shortage of trapped-in-time hotels in Bisbee, but the circa 1930s Jonquil Motel is the only one that’s also home to a famous mural. With its dreamy blues, soft teals and sky-sea imagery, artist Rose Johnson’s “Sleepwalking” piece is aptly named – and very, very big. The mural stretches 60 feet wide and 15 feet tall on one side of the motel. Circle around to the entrance and you’re greeted by a lush courtyard with access to each of the seven rooms, all outfitted with era-appropriate décor and the happy convenience of modern amenities. Suggested Souvenir: Bisbee’s Copper Queen Library is the oldest continuously operated library in Arizona. Pick up some reading material to enjoy with your coffee at the Jonquil’s courtyard. If you’ve lived in Arizona longer than a year, it’s time you got yourself a damn fine pair of boots. 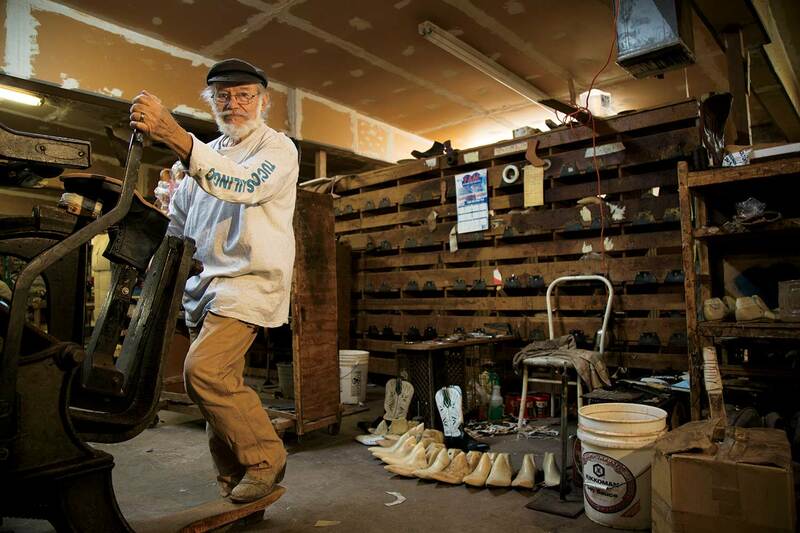 Pay a visit to Stewart Boot Manufacturing Co., one of the best custom boot shops in the state. Before you drive south, call ahead to make an appointment to ensure that Victor Borg, the bootmaker, will be on hand when you arrive. Fair warning to Amazon Prime addicts: Made by hand from a variety of leathers – crocodile, stingray, et al. – the boots take about five months to assemble and ship. But unlike Amazon finds, they’re always one of a kind. Suggested Souvenir: If you’re flush with cash, pair your boots with a matching handbag or leather satchel (prices vary). At Elgin Distillery, the spirit offerings are bountiful: single pot malt whiskey, rye, bourbon, gin and double black rum, to name a few. Winner of Double Gold at the San Francisco World Spirits Competition for the Regalo de Vida Gran Rum, the company sources its grains locally. 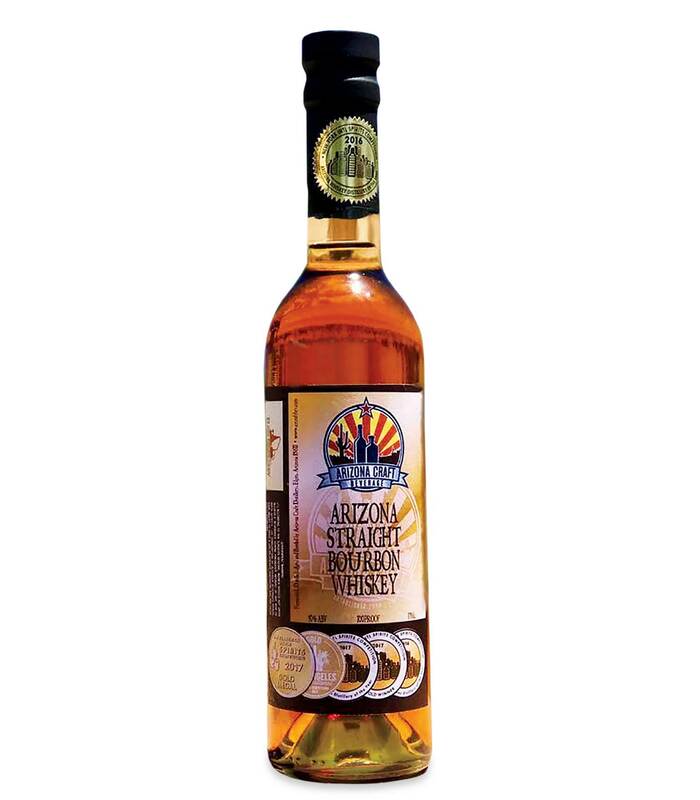 Bonus: Arizona Craft Beverage is the state’s first licensed craft distillery. At the indoor/outdoor tasting room, sample up to three ounces of the liquors, including the well-rounded Arizona Straight Bourbon Whiskey. Suggested Souvenir: Definitely a bottle of the distillery’s renowned spirits ($25-$150). 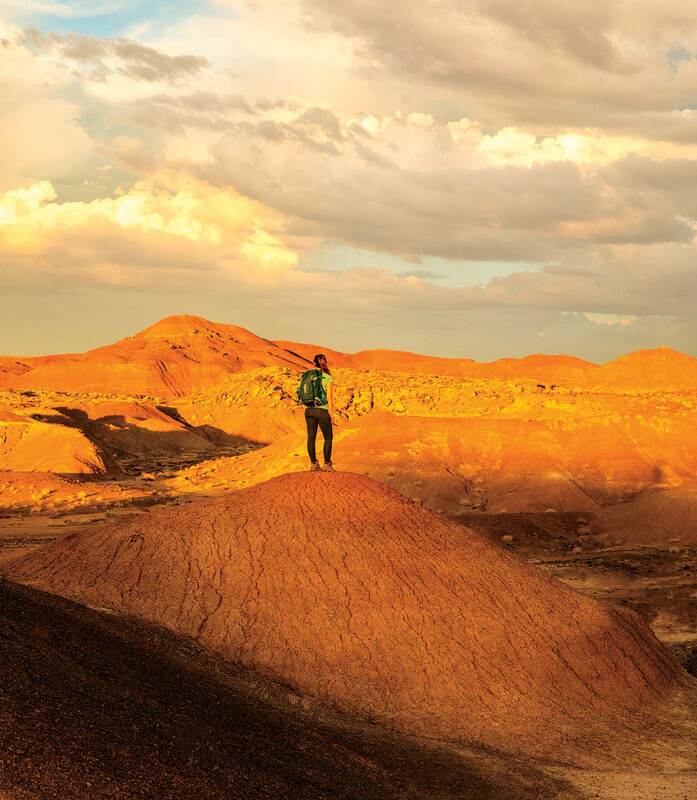 From Dinosaur Day to interactive geology programs at the rarely visited Devil’s Playground, the Petrified Forest National Park takes earth science to the next level. In the spring, it’s all about the twice monthly class Fossil Dig: Discovery and Excavation. Offered at the park by the Petrified Forest Field Institute, the instructor-led, full-day paleontological dig shows you how to chisel and chip away the earth in search of the bones of reptiles, giant amphibians and dinosaurs. Suggested Souvenir: You won’t get to take home any of the fossils you cast, so head to Jim Gray’s Petrified Wood Co. in Holbrook for one-of-a-kind fossil and shell jewelry ($30-$96). Bed down in possibly the darkest, deepest motel room in the world when you book the Underground Cave Suite at Grand Canyon Caverns. The room sits 220 feet below ground, which translates to a 22-floor elevator ride straight down. Once you arrive, there’s not a sound to be heard, nor a soul to be seen. 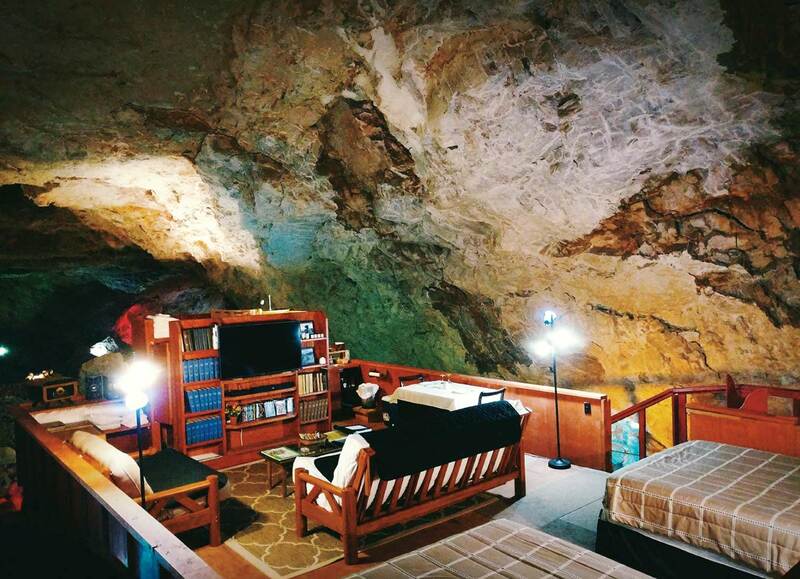 There is, however, a record player, fully stocked library, sofa, two beds and a bathroom, all surrounded by rock walls dating back 65 million years. There’s only one suite, so reserve early. If it’s unavailable, you can still tour the caverns with a guide. Did You Know? : During the Cuban Missile Crisis, the subterranean suite qualified as a fallout shelter, and food and provisions for 200 people were stored in the caverns. The sandstone walls of Canyon de Chelly tower. They loom. And at one time, they protected the Anasazi (Navajo for “ancient ones”) from the elements. That’s why they built their villages – pueblos – into the sides of the canyon cliffs. The White House Ruins (so named because of the white plaster that coats one wall of the upper dwelling) is a naturally preserved example of these pueblos, and unlike the rest of Canyon de Chelly, you don’t need a Navajo guide to access it – just a pair of hiking shoes. The 2.5-mile round trip traverses a well-marked, easy to moderate trail to the bottom of the canyon where the two-story ruins sit. Start in the morning to avoid the midday summer sun. Suggested Souvenir: Bring cash ($20-$40) to buy jewelry from the Navajo women selling items at the bottom of the canyon. Go where the breezes are cool and the treats are sweet. 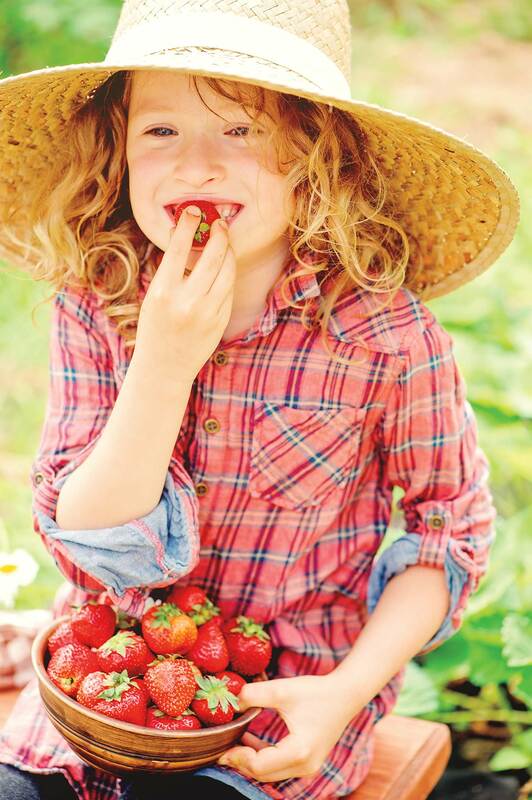 Head up to the mountain town of Pine for the Strawberry Festival. This annual summer event boasts flats piled high with fresh strawberries (perfect for those of us not in the mood for a U-pick experience), food trucks, artisan vendors and yummy goodies made from – what else? – strawberries. 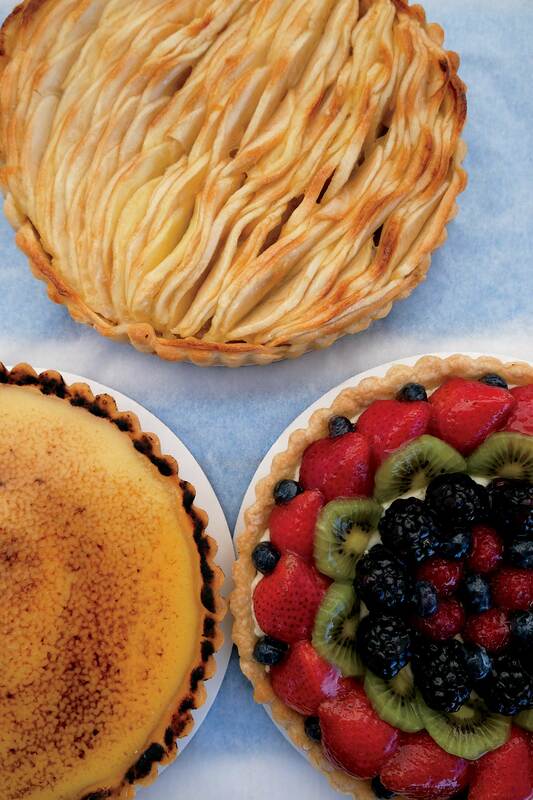 This means shortcakes, jams, pies, floats, sundaes and chocolate-dipped ’berries. Suggested Souvenir: Not sure what to do with a whole flat of strawberries? Purchase a community-created cookbook with strawberry-centric recipes. 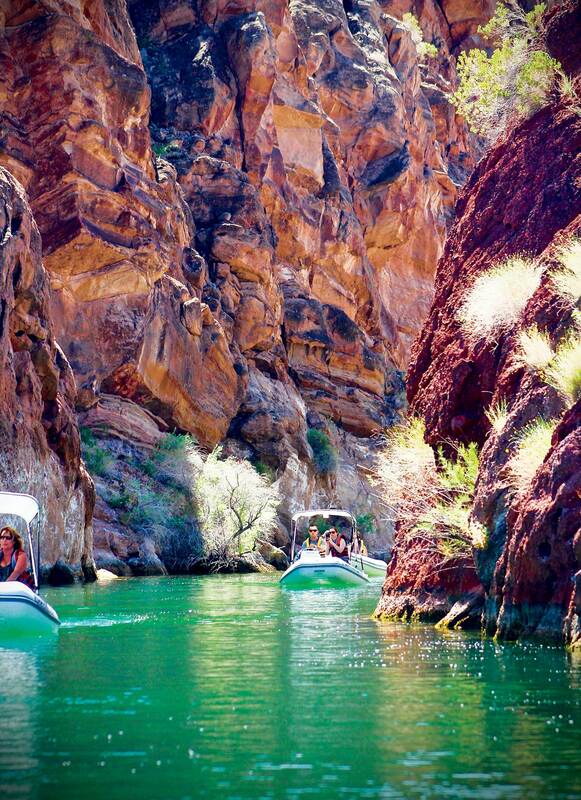 This summer, forget the wild houseboat parties at Lake Pleasant. Instead, rent a pontoon from Precision Marine on laid-back, picturesque Canyon Lake. This style of boat is built for day cruising: wide, flat, easy to operate and roomy enough for eight or 12 of your friends. No grills allowed – chips and salsa, it is! – but you can bring as much of the cold, canned beverage of your choice as you want. 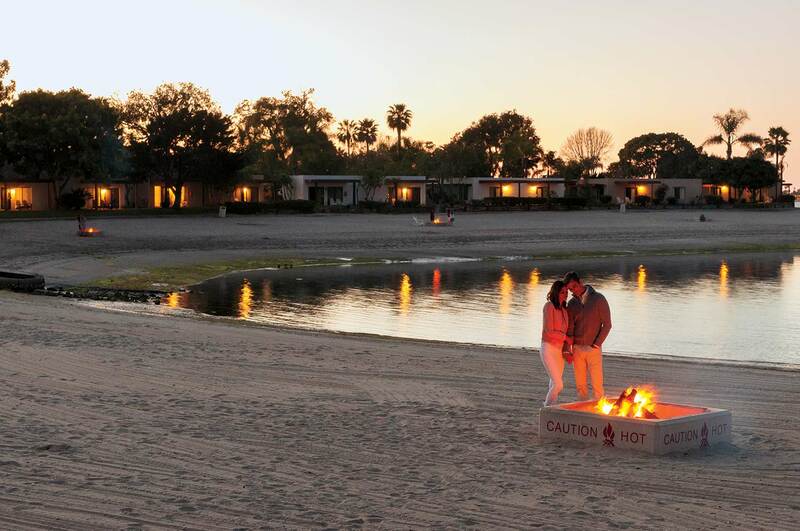 The lake offers 950 acres of calm waters to explore, with 28 miles of Sonoran Desert shoreline. If you look closely at the rock escarpments that surround the lake, you might see the bighorn sheep that balance precariously on the ledges. Suggested Souvenir: Stock up on boat snacks at the nearby Tortilla Flat Country Store, where you can buy homemade salsa and fudge. When it comes to evaluating RV destinations, we like to keep one factor mainly in mind: remoteness. 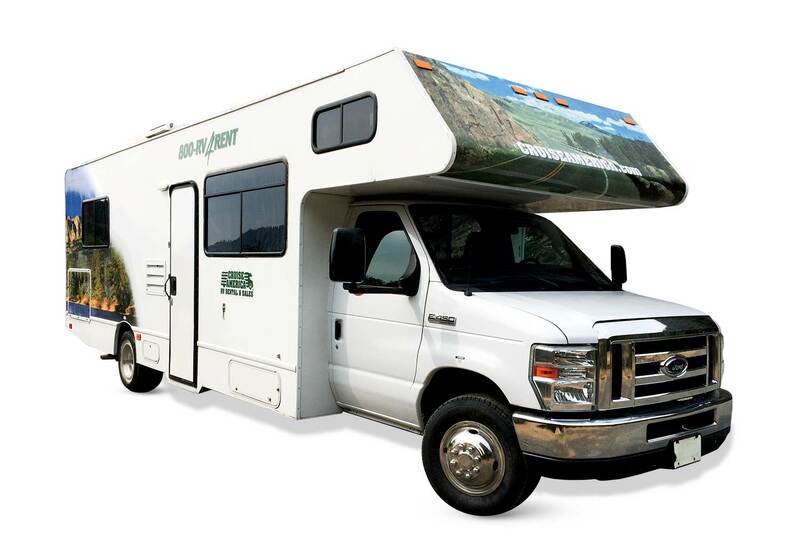 Because what’s the point of driving an RV to a place that has hotel rooms everywhere? 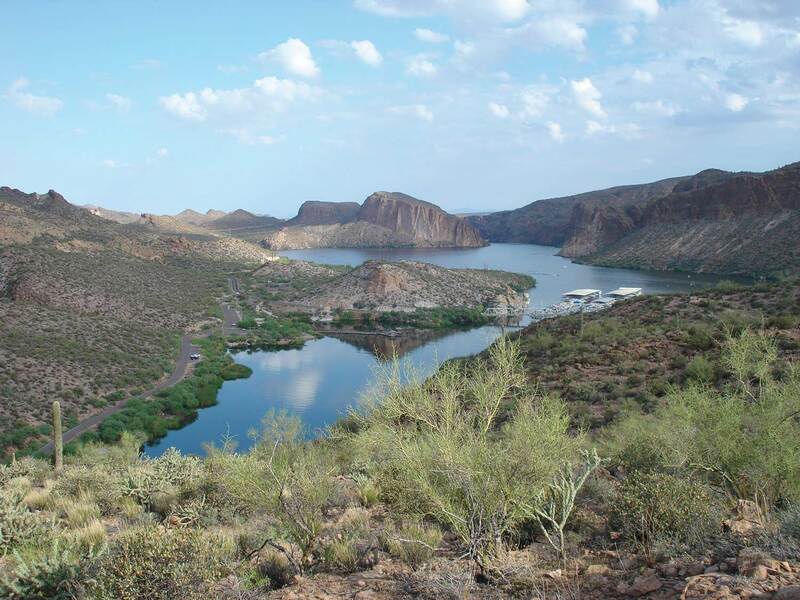 By that metric, here are our Top 3 RV campgrounds in Arizona for a nice summer getaway. You don’t have to wait until Halloween to dress up as your favorite Game of Thrones character. On July 12-14, don your best medieval attire and get thee to Winterfell – er… the green hills of Pinetop-Lakeside – for a weekend of knight battles, drum performances and hearty drink. The Medieval Mayhem Renaissance Festival showcases the time period from the Dark Ages to the Renaissance, and the myriad costumes, arts and crafts, performances and demonstrations reflect this wide swath of history. Suggested Souvenir: At the festival, vendor Slouch Cat Creations sells gauntlets ($275 for a pair), helmets (from $160) and a pair of movable arms ($170). There’s a right way and a wrong way to eat crawfish. Here’s the right way: Pinch the end of the tail between your thumb and forefinger. Twist and snap the head from the tail. Peel the shell from the widest part of the tail, like peeling a shrimp. Hold the tip of the tail and gently tug out the succulent meat. Enjoy! 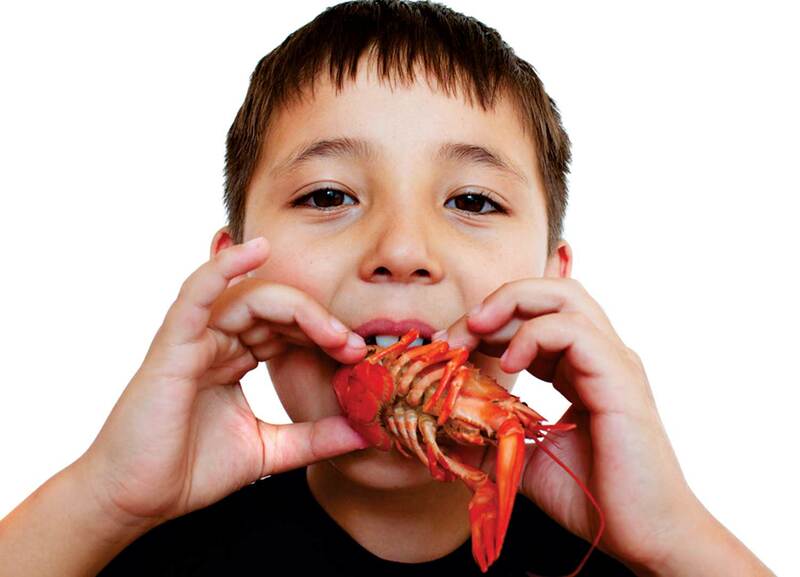 You’ll thank us for that mini-lesson when you attend the Arizona Crawfish Festival, also known as the Cajun Fest of the West (we just coined that). Besides pounds of flavorful crawfish to eat, the festival also offers live music, face painting and bounce houses for the kiddos. Suggested Souvenir: Impressive wood carvings of bears, eagles and lumberjacks (prices vary depending on size) dot the yard in front of local gift shop Wild Woods. Soothing, peaceful, cool. Those are three words you want to hear – and experience – when you’re caught in the deep, hot heart of a scorching Phoenix summer. Pack up the family and make your way to a shady mountain campsite at Riggs Flat in the Coronado National Forest. 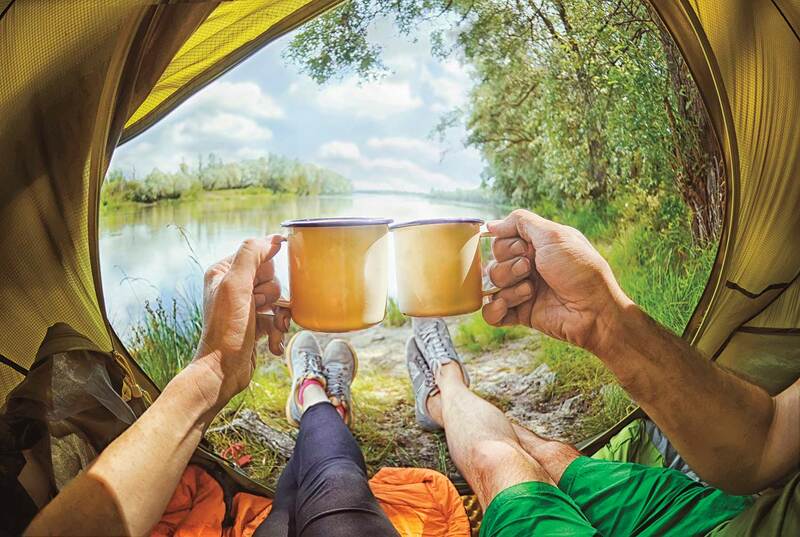 This is tent camping at its best: hiking trails that lead to scenic vistas, picnic tables at each site and a cold lake for swimming, splashing and drifting lazily on an inner tube. Bonus Activity: Fishing! Riggs Flat Lake is stocked with brook, rainbow and brown trout. A valid Arizona fishing license and trout stamp is required for all anglers 14 years of age and older. Today’s winemakers no longer use the old method of stomping on grapes to process them for harvest – there is all sorts of fancy machinery for that now. But every summer, Sonoita Vineyards pulls 800 pounds of grapes off the vines and invites the public to commence harvest season by joining a traditional, symbolic grape stomp. At the Harvest Fest & Grape Stomp (July 27), celebrate all things Arizona wine with tastings, wine and food pairings, winemaker-led tours of the winery and vineyard and – of course – the big stomp. Suggested Souvenir: Keep your free souvenir glass; it’ll come in handy for summer pool parties. To reboot the mind, body and spirit, sometimes we need to unplug from modern technology. 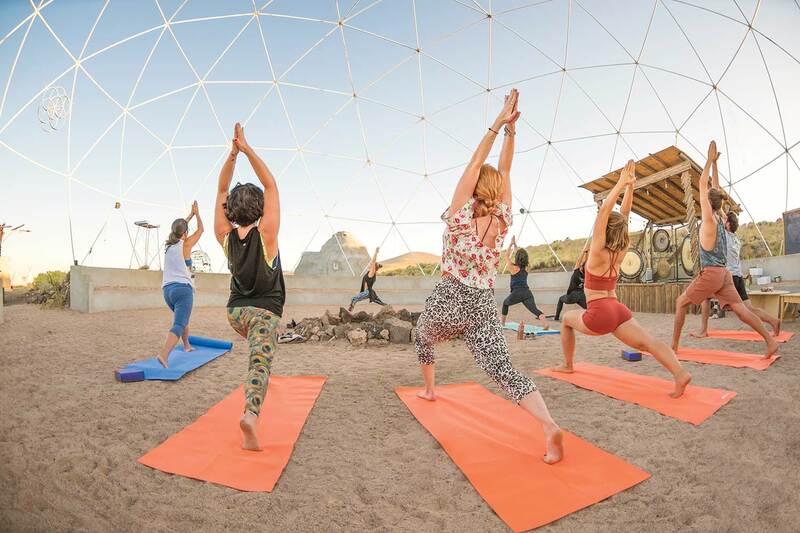 That’s exactly what founder Caroline Jones had in mind for Restival Arizona, a weeklong tech-free sanctuary that not only allows you to rejuvenate with wellness treatments, meditation, yoga and sound therapy but also unveils a glimpse of traditional Navajo life and culture. Art classes cultivate creativity, horsemanship workshops teach communication, flotation tanks release tension, and seasonal, organic meals nourish. Come stressed, leave transformed. Keep It Real: Don’t worry; you don’t have to abandon all comforts of home. 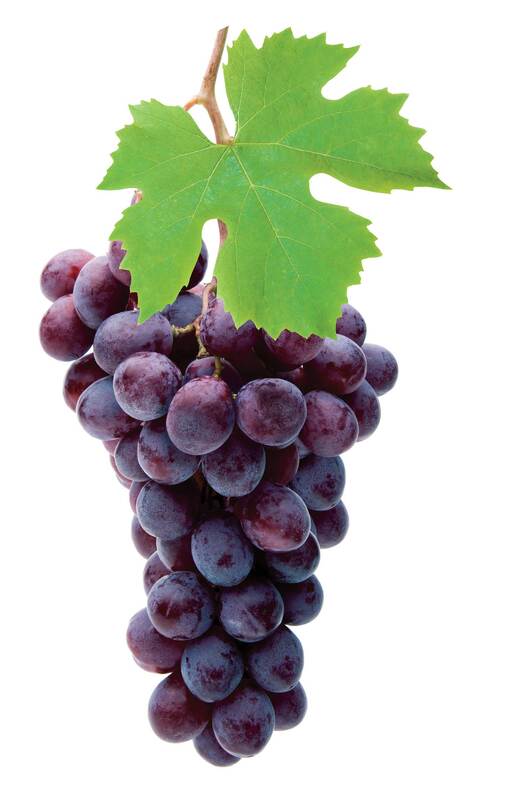 You can still enjoy your usual evening glass of wine – biodynamic vino, of course. Apple Annie’s may be better known for its fall harvest of crisp apples, but this fruit-ful orchard and farm also produces pears, pumpkins, watermelons, sweet corn, chiles and more. In the summer, it’s all about peaches. Get your fill of sweet, juicy, tree-ripened fuzzy orbs at Apple Annie’s Peach Mania Festival. 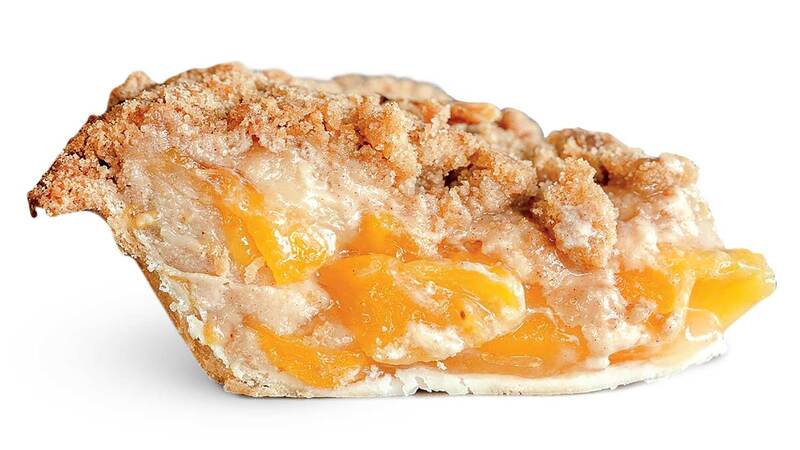 Peaches & Pancake breakfasts, wagon rides, peach picking and free samples of peachy treats round out the weekend fun. Suggested Souvenir: You’ll have your pick of farmhouse-style goods at Apple Annie’s Country Store, including its branded coffee mug ($12). See the aquatic sights with a Rubba Duck Safari. This quirky water tour lets you captain your own four-person inflatable boat as you follow the guide boat (“Mother Duck”) on a 2.5-hour marine adventure. You’ll explore Bridgewater Channel, spot wildlife in Copper Canyon and ply the open waters of the lake. Wear a bathing suit as you’ll get a chance to enjoy a swim. Never piloted a boat? No worries. The instructors lead you through a 20-minute lesson. Suggested Souvenir: At College Street Brewhouse, grab a T-shirt sporting the brewery’s logo ($20) or a pink-and-white hat that features Big Blue Van ($20), one of its signature beers. 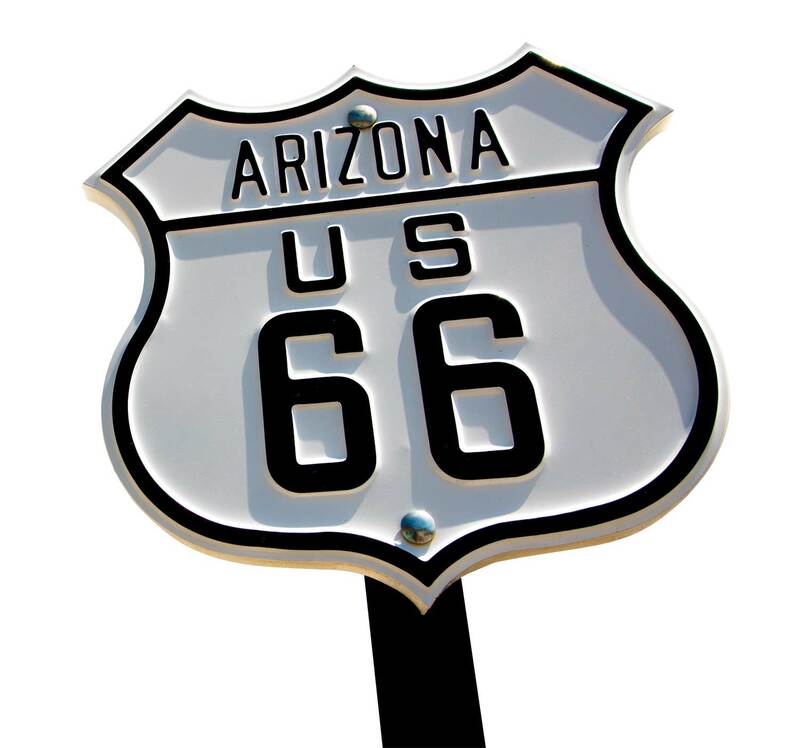 Motels originated in the 1930s when cars surpassed trains as the preferred mode of transportation, and Route 66 was the Arizona road trip during the Mother Road’s heyday. For a retro summer retreat complete with refreshing mountain breezes, reserve a room at the classic Lodge on Route 66. Cozy outdoor chairs let you relax on the lodge’s patio while the homey rooms boast elegant “lodge” décor – solid wood furniture, plump throw pillows, super soft bedding. Suggested Souvenir: Visit nearby Western Outfitters (316 W. Route 66) for a handsome turquoise-inlay bolo tie ($50-$60). Do you love romantic comedies starring Jennifer Lopez and film endings that wrap up plot points? Then don’t attend the Jerome Indie Film & Music Festival. Here, you’ll get to see independent cinema that pushes boundaries both culturally and artistically. You’ll meet filmmakers. 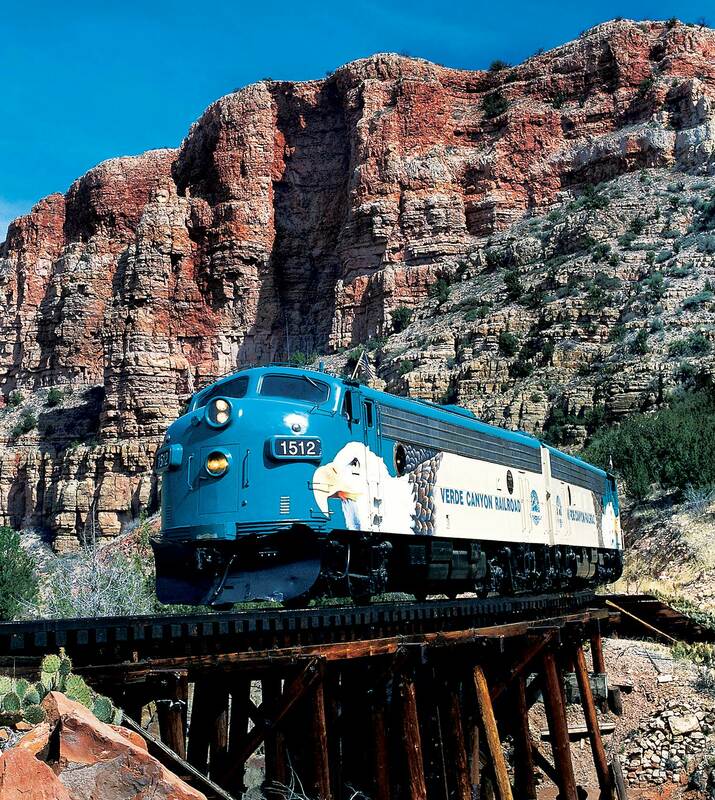 You’ll watch movies in a train (pictured) or a haunted gold mine. Plus: live music and parties. Even better. Suggested Souvenir: Fit in with the local crowd by donning a brightly patterned silk poncho ($112) by fiber artist Debra Street, available at Pura Vida Gallery in Jerome. Fees: Costs vary; options range from single film ticket purchases to all-inclusive VIP packages. Why is it that the stuff we deem trash – old buttons, a tool you no longer have use for, a Zippo lighter – when displayed artfully in a tiny shed suddenly becomes interesting? 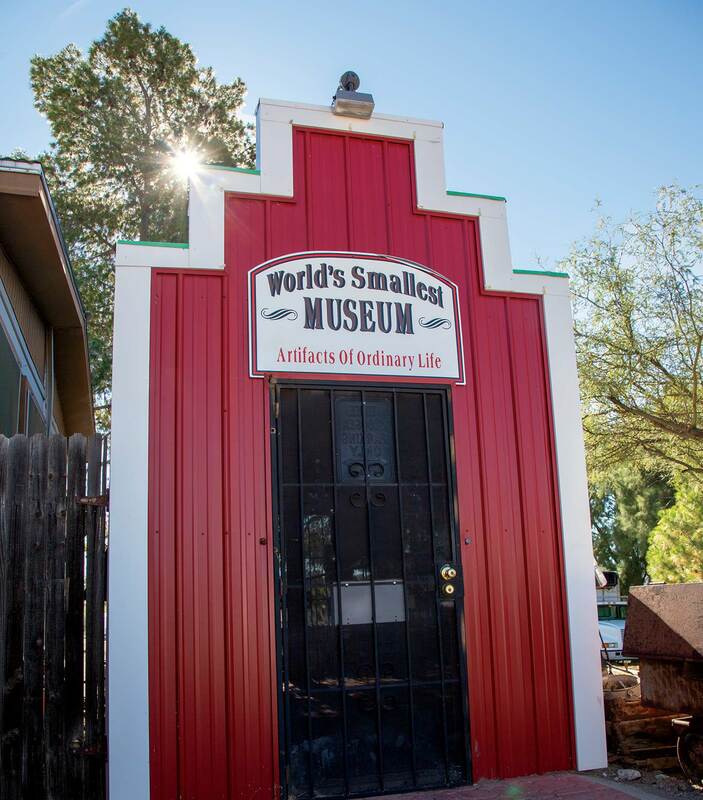 Herein lies the magic of the 20-years-strong World’s Smallest Museum, where ordinary artifacts of daily life are curated to create a snapshot of modern human identity. In 134 square feet, you can tour the “exhibits,” which include a 1984 Compaq home computer, a Beatles poster, a 1960 letter from president-elect John F. Kennedy and a cool rock. Bonus Oddity: See a vintage Chuck Berry concert poster from a 1957 show in Ohio. How do you build a robot from recycled materials? What’s the surface of Mars like? Learn the answers to these questions and more at the Flagstaff Festival of Science. This 10-day, interactive event invites science-y types – and everyone else – to partake in field trips, sky parties, archaeological excavations, workshops, and even astronomy for preschoolers. Sign up for as many or as few programs as you wish, including evening fun like movie nights and pajama parties. Science camp is more fun than you think, we promise. Suggested Souvenir: From the Lowell Observatory Gift Shop, sport “Just a Phase” knee-high lunar socks ($15) or a T-shirt that says “Math is hard. So is life. Get over it.” ($28). If you’ve never seen the wondrous Valley of the Moon, you’re in for a delightful surprise. 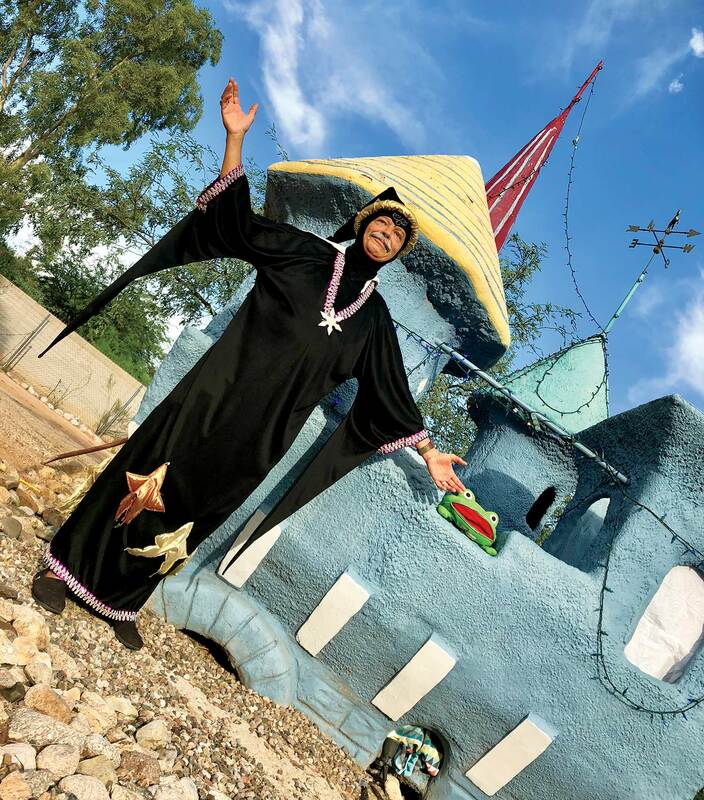 Built in the 1920s by George Phar Legler, this passion project transformed the desert into a DIY theme park that melds fantasy and reality. Winding paths lead to fairy houses; waterfalls tumble next to trees with carved faces; homes for gnomes sit near hidden grottoes. 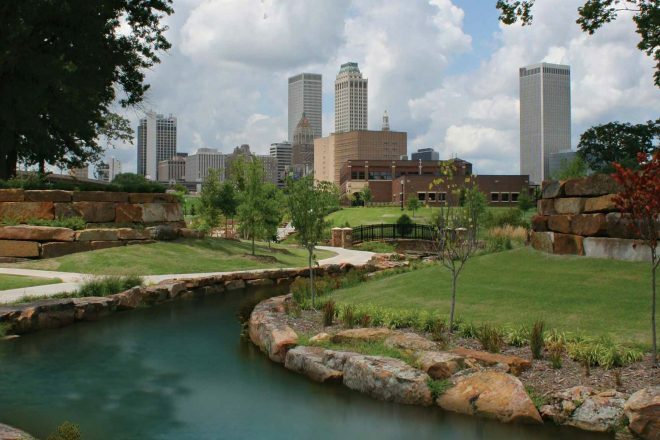 To experience the full scope of this odd and beautiful place, join a docent-led historic tour. Fun Fact: Legler got the idea for Valley of the Moon after building an elaborate miniature mountain scene to cheer up a terminally ill girl who was dying of tuberculosis. Set off on an easy 7-mile hike on one of the best trails in the country. Why “best?” Perhaps it’s the brilliant fall colors. Maybe it’s the babbling brook that bisects the path, encouraging you to hop from stone to stone to cross the water. 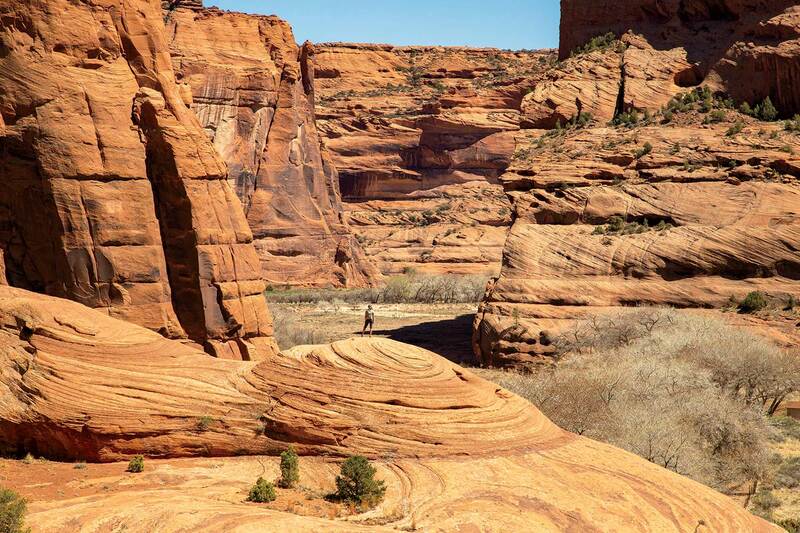 Or it could be the red canyon walls that stretch upward on either side. Whatever enchantment the place holds for you, have your camera ready for picturesque autumnal scenes around every corner. Suggested Souvenir: Wild apples. 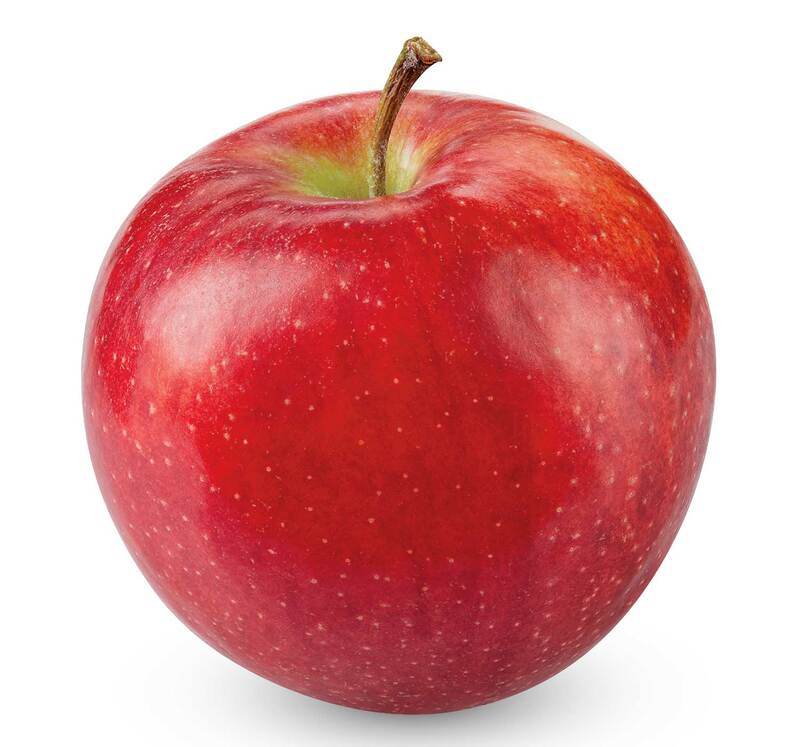 Bring an empty tote to fill with fresh apples dropped from trees in the grassy field just off the trail, near the beginning of the hike. 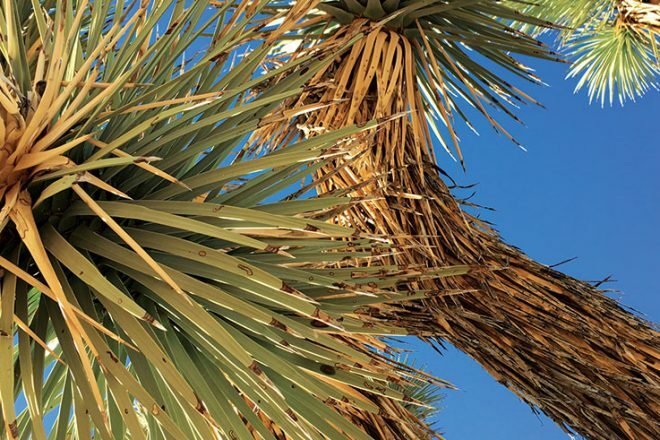 Raise your hand if you’re over Coachella – the crowds, the heat, the expense, ugh. Instead, opt for our very own Apache Lake Music Festival. This two-day outdoor bonanza of live music features Arizona’s top homegrown bands (Banana Gun, Sugar Thieves, Decker) and plenty of restful lakeside camp spots for you to hang your hammock. If you’d rather overnight indoors, book a room at the nearby Apache Lake Marina & Resort. Did You Know? 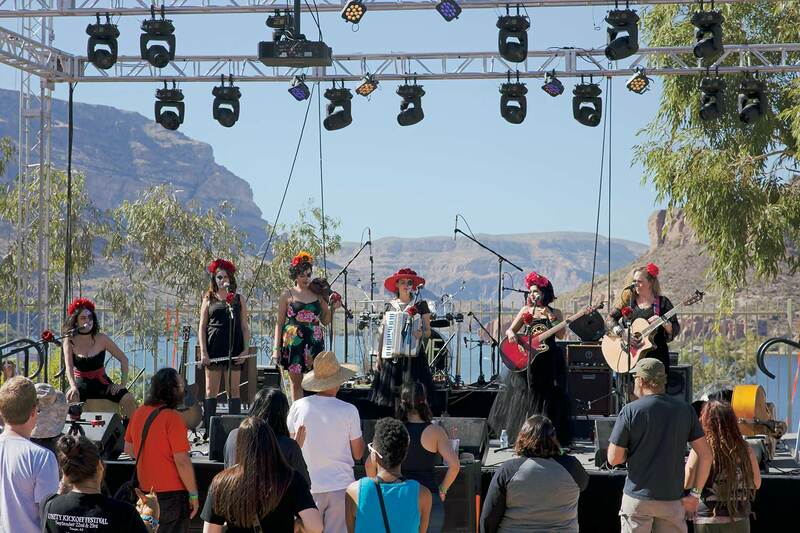 : The Apache Lake Music Festival celebrates 10 years in 2019 and is one of the few all-local music fests in the state. 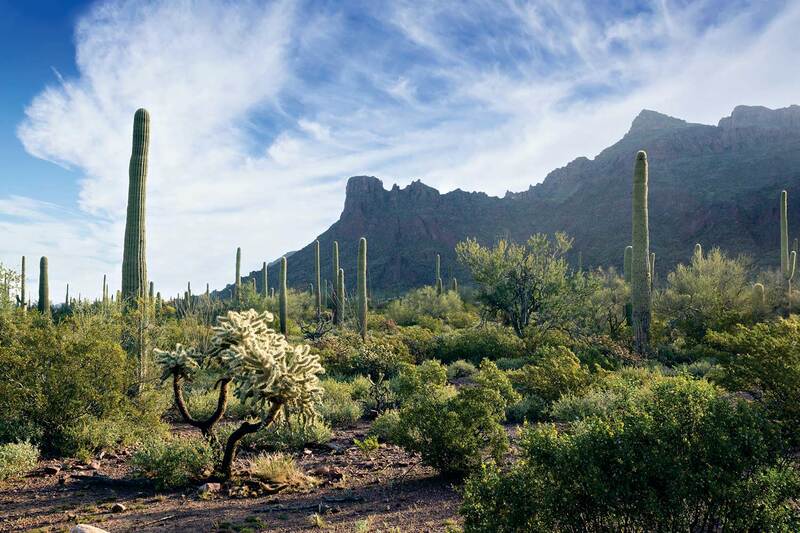 The Organ Pipe Cactus National Monument spans 330,000 acres and is the only place in the world where the organ pipe cactus grows wild. The 3.5-mile loop of Estes Canyon Trail on Ajo Mountain stays relatively flat until it links with Bull Pasture. As you begin the climb, you’re rewarded with stellar views that extend nearly 20 miles, showing off stands of organ pipe, ocotillo and saguaro cacti. Suggested Souvenir: Shop for a saguaro cactus mini block set ($10) or a Sonoran Desert 500-piece puzzle ($14) at the Kris Eggle Visitor Center. When fall is slow to arrive in Phoenix (100-degree days in October, anyone? ), sometimes you have to force the issue. 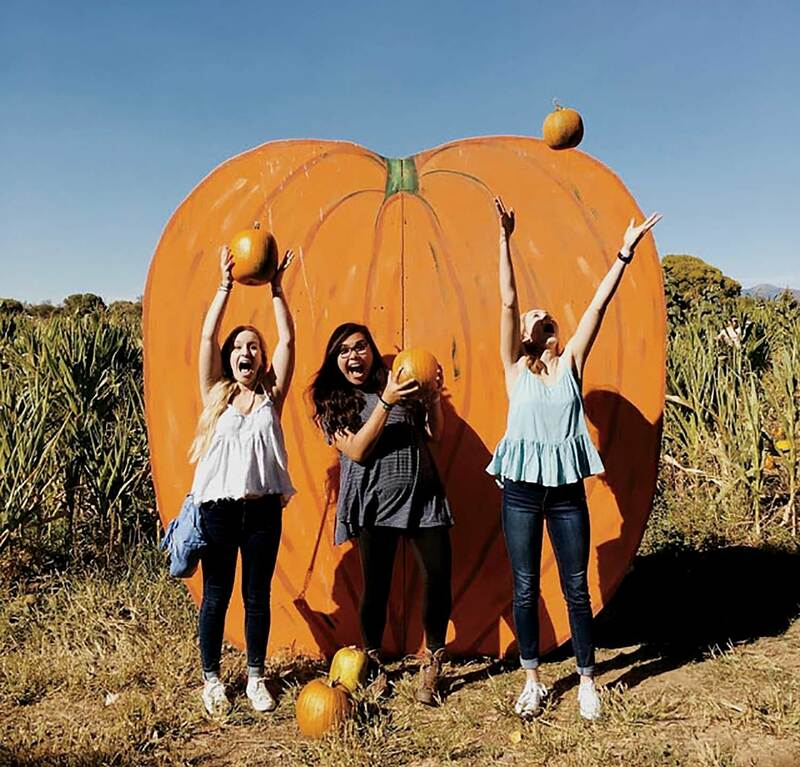 Set your car’s GPS to Mortimer Farms Pumpkin Fest & Corn Maze, where every weekend in October, the Mortimer family invites the public to partake in fun on the farm. Navigate the corn maze, go for a hayride and definitely stay for the barn dance on Saturday nights. Suggested Souvenir: Specialty pumpkins will run you $1 per pound, while the classic orange ones go for 75 cents per pound. 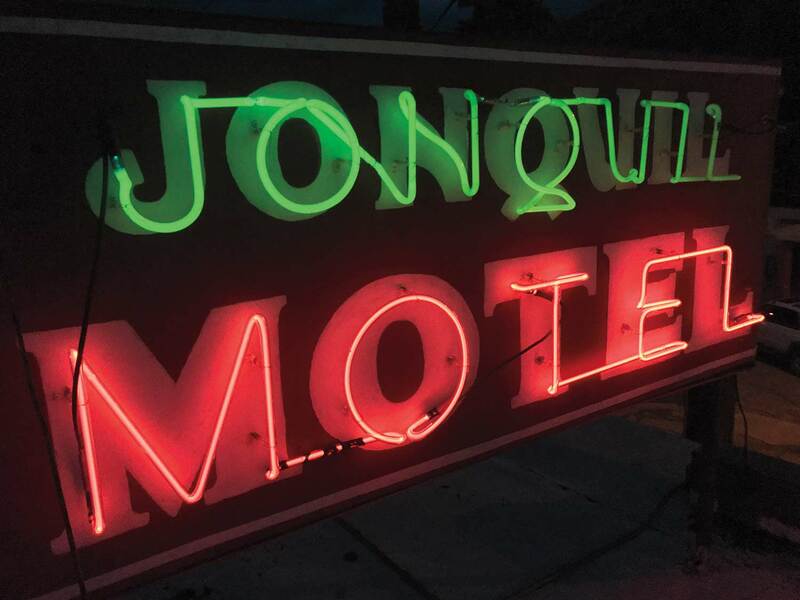 The funky, retro décor of this 12-room motor court – with requisite neon sign, of course – feels reminiscent of a 1960s motel, even though the lodge was originally built in 1910 as a cluster of summer cabins. The rooms are modern and snug, and when the snow falls on the pine trees outside, switch on the gas fireplace and crack open a bottle of wine. Most rooms have private patios, but if you want to make friends, sip your morning coffee on the motel’s front porch. Walkability perk: The Motor Lodge is located in the heart of downtown Prescott. Suggested Souvenir: The art – glassworks, paintings, sculpture – at Arts Prescott Gallery showcases the distinctive works of local artists in and around Prescott. Because of the wide range of offerings, costs vary. Read: You can find great art at affordable prices. 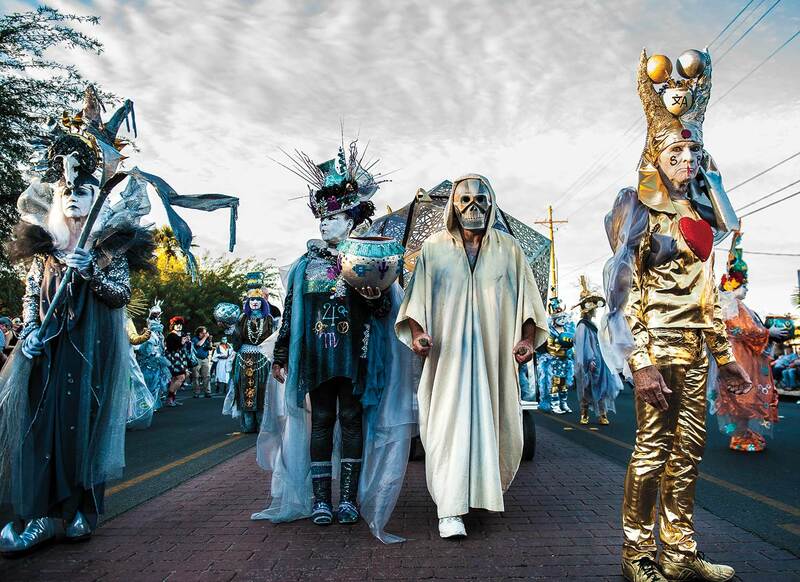 More than 150,000 participants come together on the streets of downtown Tucson for the All Souls Procession Weekend, a powerful Day of the Dead celebration. Remembering our loved ones who have passed on doesn’t have to be dour, as this time-honored tradition rich with rejoicing proves. The 2-mile procession ends in the ceremonial burning of an urn filled with offerings and wishes for those who have died. Make sure to add yours before the procession starts. Suggested Souvenir: The Lost Barrio Shopping District hosts Day of the Dead shopping and festivities on Saturday from 10 a.m. to 8 p.m. Early in the morning as the sun starts to illuminate the dark sky, hundreds of colorful hot air balloons rise up from the ground in silent ascent. It’s a beautiful sight to behold, and one that you can catch every morning during the Colorado River Crossing Balloon Festival. Arrive earlier than takeoff to enjoy coffee and hot chocolate while you watch the pilots prepare for flight. 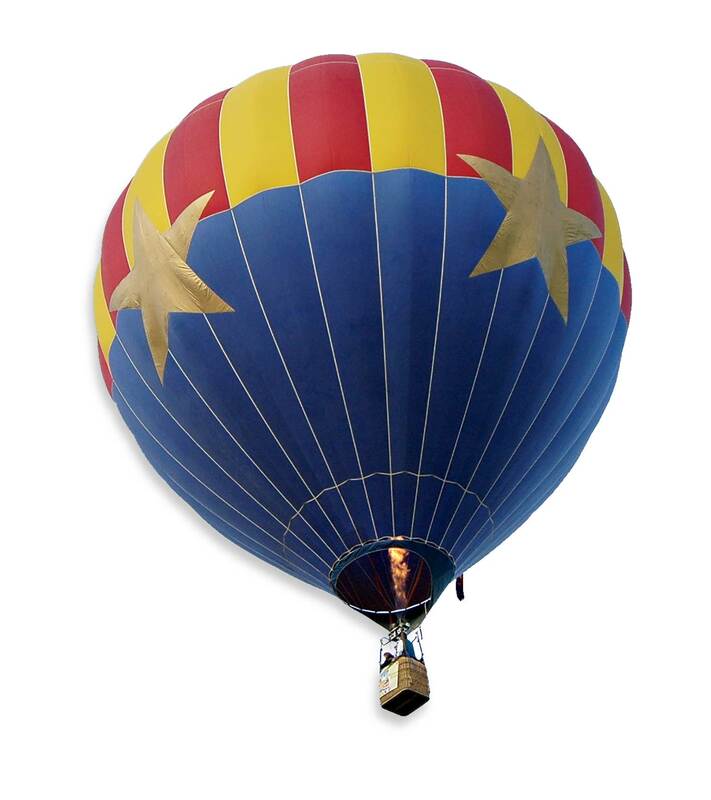 On Saturday evening don’t miss the Desert Balloon Glow, a show where tethered balloons fire their burners to light up the sky in synchronicity to music. Suggested Souvenir: Every piece at Colorado River Pottery – including the Yuma tray set ($35) – is hand-thrown on a wheel or slab, then fired in the kiln at the on-site studio. Think of the Flagstaff-Grand Canyon Ale Trail as your passport to a discounted craft brew adventure. For one, you actually get a literal passport to stamp at each of the 10 breweries on the trail. 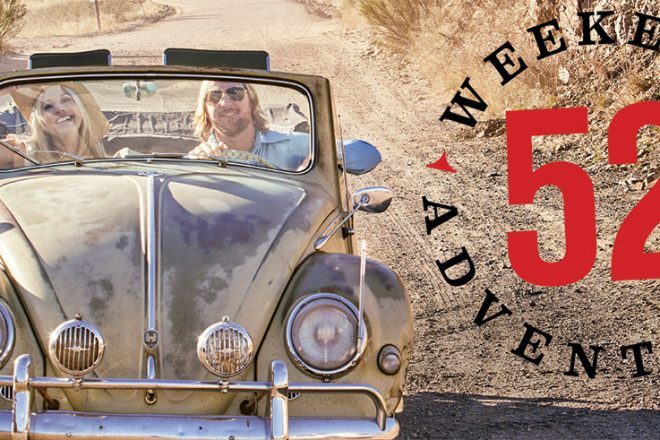 Secondly, the trail takes you from Flagstaff to Williams and Sedona, quite the epic journey for beer – and one that definitely requires a designated driver. Notable stops on the route: Grand Canyon Brewing Co. (love the Sunset Amber Ale), Mother Road Brewing Co. (tall-boy Tower Station all the way) and new kid on the block Dark Sky Brewing Co. (experimental one-offs on a rotating basis, so go with a flight). Glamping isn’t just about luxury linens and king beds. Although five-star sleeping is certainly part of the package when you book with Under Canvas – one of the country’s most innovative outdoor-luxury programmers – the company’s new Tucson glamping adventure includes much more than that. 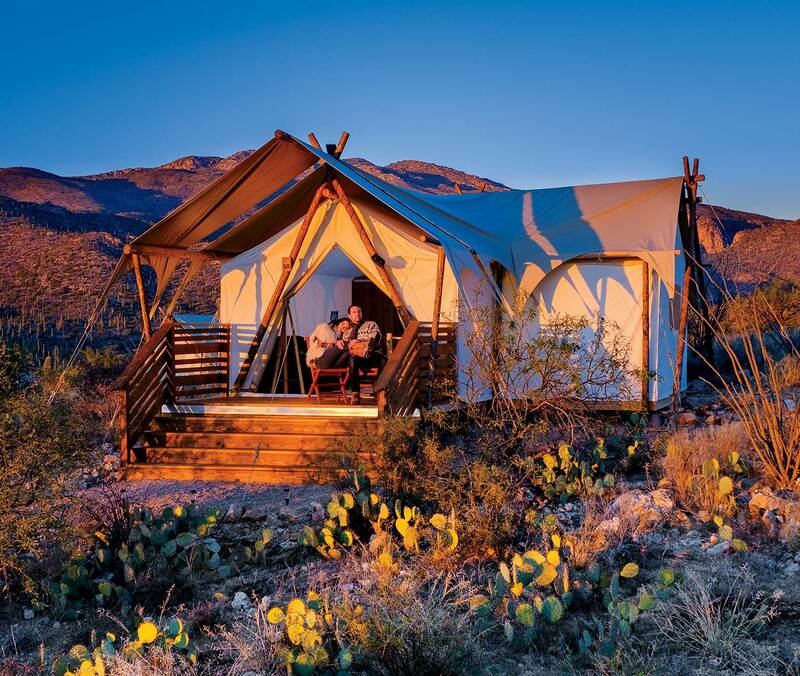 Located 12 miles from Saguaro National Park, the glampsite spreads across 60,000 secluded acres. Enjoy A-list perks including private tours of the park, horseback riding, mountain biking and sunset safari tours. And yes, fancy tents with hot showers and wood-burning stoves. Bonus Perk: Book the Stargazer tent. The king bed tucks into an alcove with its own viewing window through which you can see millions of stars overhead. Forget Black Friday. Ignore Cyber Monday. Complete your holiday shopping outside of the box – and literally outside – at Tucson’s largest year-round farmers’ market: the Heirloom Farmers Market at Rillito Park. More than 80 vendors, from farmers and ranchers to artisans and chefs, gather here to sell their wares. A chunk of handmade goat milk soap for your aunt? Done. Fair Trade coffee for your boss? Sold. What about slow-cooked, small-batch pet food for your pup? Buy it here. If you time your visit with Holidays at the Market (Dec. 15), you’ll enjoy live music, chef demos, raffles and killer deals. But Wait, There’s More: The market at Rillito Park is one of five markets in the Tucson area hosted by Heirloom Farmers. If you can’t make the Sunday one, you’ll find others during the rest of the week. If you’re wondering why there’s the English Village in Lake Havasu City, then perhaps you haven’t heard the story of the London Bridge. 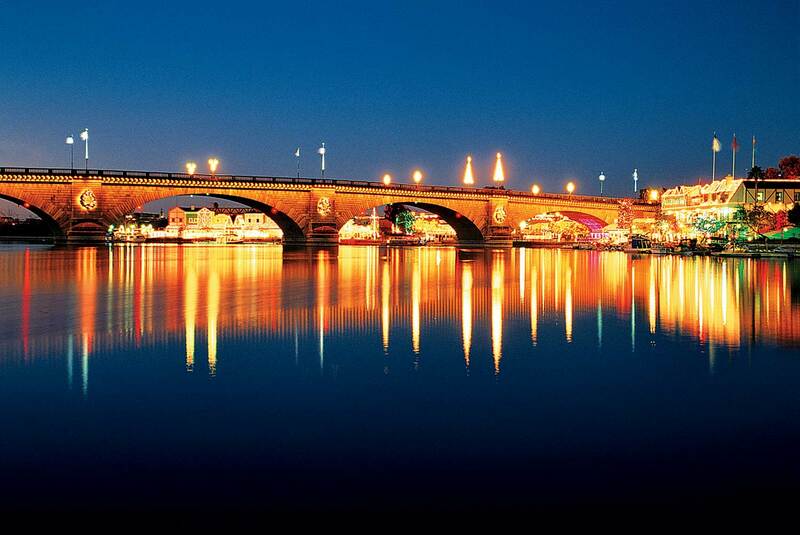 Quick recap: The 1830s bridge that originally spanned the River Thames in London was moved, brick by brick, and rebuilt in Lake Havasu City in the late 1960s. As a nod to its U.K. roots, the northeast end of the bridge sports an English Village, a kitschy but quaint collection of shops and pubs. During the holidays (Thanksgiving until after New Year’s Day), the village becomes aglow with hundreds of festive lights, ice skating and visits from Santa. Suggested Souvenir: Everyone needs a bar of luxury soap. At Havasoap in the English Village, pick your base (goat’s milk, aloe, honey, oatmeal), select a fragrance and a shape (the animals are cute, but go for the London Bridge), and voilà! You have custom, fancy soap. From $5. You probably don’t think much of pinecones – until you see a 6-foot, 70-pound aluminum pinecone lit up in all of its glittering glory. 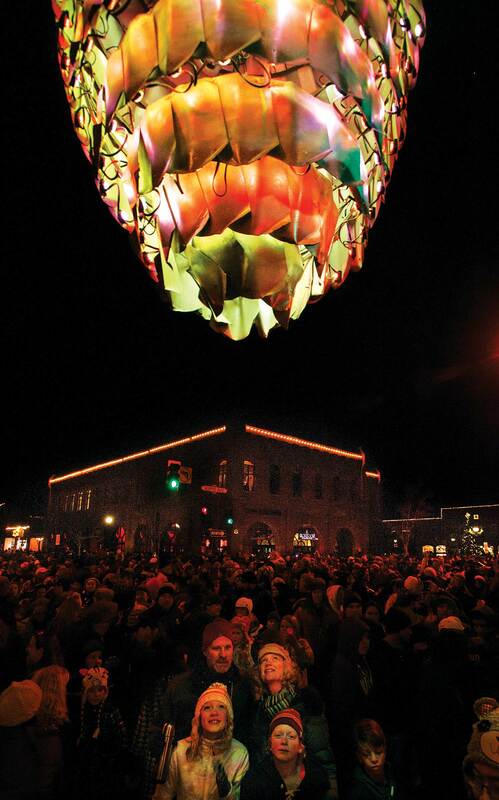 Flagstaff rings in the New Year like any respectable mountain town, with The Great Pinecone Drop. Dressed like a holiday ornament, the illuminated conifer spore is hoisted above the historic Weatherford Hotel, descending as the clock nears midnight on Dec. 31. A light show, fireworks and general (often frozen) revelry follows. Suggested Souvenir: Bring back a pine tree ornament ($10) from Flagstaff General Store – a slice of pine bearing a woodsy design etched into the bark. If you need to get away from the holiday madness and are craving a self-care weekend complete with massages, facials, yoga, hikes and healthy eating, look no further than Red Mountain Resort. With thinner off-season crowds drawn to the region’s signature attraction, neighboring Zion National Park, winter is an ideal visitation time. The resort is also perfect for a solo trip – with its combination of community tables and shared soul-bearing experiences, you’ll never truly feel alone. 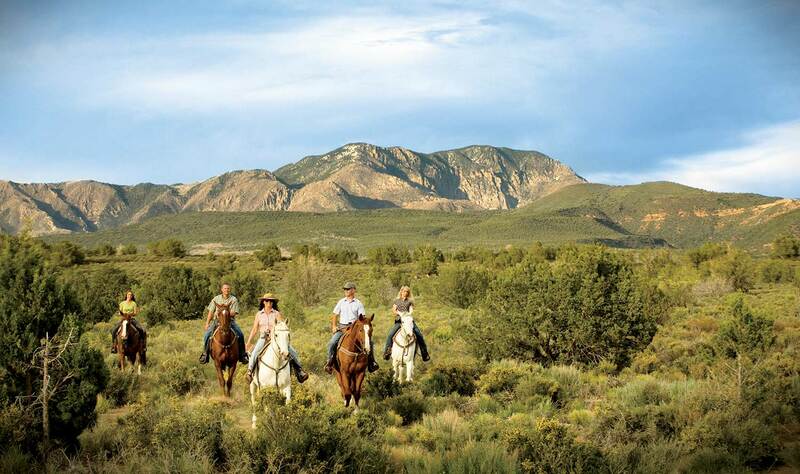 Our favorite: Where Heart Meets Horse, in which you visit a herd of wild-born mustangs at Windhorse Relations corral. You’ll meet the animals and learn how to calm them by mastering your own anxieties and fears. Eventually, you’ll be able to lead them with just your inner confidence and energy. Look ma, no hands! The Red Mountain Revitalizer, a soothing sugar scrub followed by a Vichy shower, is the perfect post-barn spa treatment to keep the good vibes going. Suggested Souvenir: The Inspired Eating cookbook ($35) by Red Mountain Resort’s incredible kitchen staff. Now you can make all the delicious tofu steak you want when you get home. Once spring has sprung, winos start thinking pink. The best place to rosé all day? Malene Wines in San Luis Obispo. 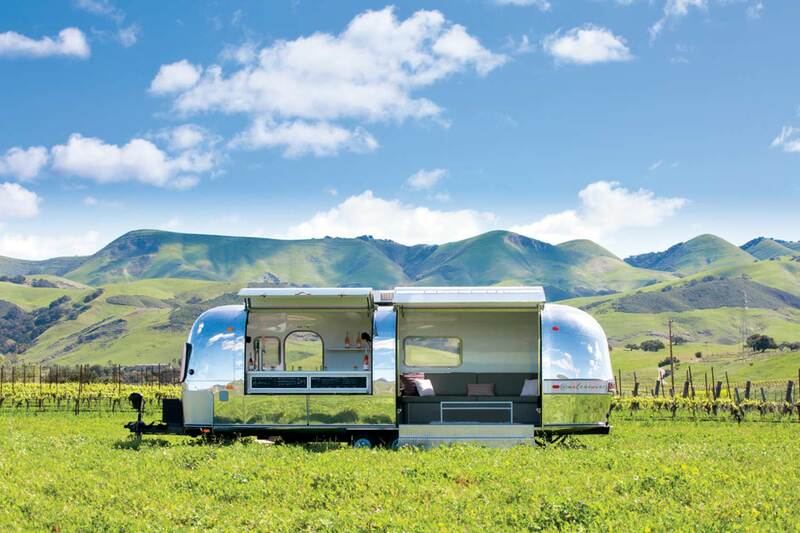 The rosé-centric label (sister winery to SLO’s celebrated Chamisal Vineyards) boasts rosés of Mourvèdre, Grenache, Cinsault, Vermentino and Syrah, all available on tap in a 1969 Airstream Overlander trailer that’s been converted into a chic mobile tasting room perfect for bachelorette parties and girls’ getaways. “Rosé has grown up, and it’s a joy to work on a brand like Malene Wines that is solely devoted to crafting rosé,” winemaker Finan du Fresne said in a press release. Du Fresne uses whole-cluster pressing, long and cool fermentations and sur lie aging in French oak and stainless steel to evoke the crisp fruit flavors, creamy mouthfeel and pale hues of the best Provençal pinks. The “Malene Scene” Airstream is open to the public Fridays through Sundays from 10 a.m. to 5 p.m.; call ahead to book a private tasting. Suggested Souvenir: The 2017 Old Vine Rosé of Grenache ($35) is the product of 44-year-old vines and bears tropical opening notes (crisp papaya and kiwi) that blossom into citrusy sensations of lemon and orange, with hints of almond. Ensconced on its own piece of floating jungle in San Diego’s Mission Bay, Paradise Point Resort & Spa has long appealed to weekenders who favor an insular alternative to the city’s famously rowdy public beaches. Bike trails snake in and out of the property’s transportive menagerie of tropical plants and trees, and its tucked-away North Cove Beach boasts 14 s’mores-ready fire pits – a vestige of San Diego’s less-regulated yesteryear. But the resort’s newest wrinkle is probably something founder Jack Skirball didn’t envision when he debuted the property in 1962 – a hi-tech, eco-friendly makeover completed last summer, bringing each of its 462 bungalows in line with modern design and efficiency standards. So now you can wash off the campfire smoke under German rain-style showerheads, and rest your quads on a plush new mattress while zoning out to a 4K hi-def TV. Suggested Souvenir: The recipe for the lip-smacking white ponzu and hibiscus mignonette that chef Andrew Reyes (formerly of True Food Kitchen) serves with his oysters at Tidal, the resort’s flagship restaurant. If you praise the bivalves vigorously, he might give it to you. We PHOENIX mag folk have been to a hell-ton of music festivals over the years, both local (M3F, Lost Lake, Country Thunder) and extra-regional (Lollapalooza, Austin City Limits). 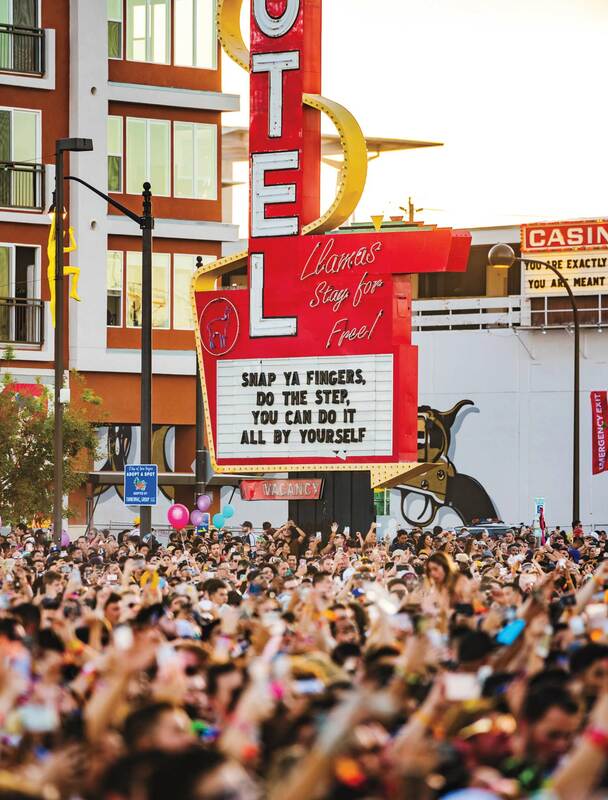 But we’ve never been to one quite like Life Is Beautiful, which debuted in Las Vegas in 2013 and has thrived in a crowded market for multiday music events.  One of the main reasons: Founder Rehan Choudhry somehow convinced the powers that be to let him rope off 18 blocks of downtown Vegas for stages, tents, food trucks and merch booths, creating a truly singular festival-within-a-city gestalt, with bars, motels and restaurants all located within the event grounds. The lineups – featuring a well-judged, democratic mix of indie rock, hip-hop and EDM – are consistently awesome, too. The bands for the 2019 event (September 20-22) will be announced this summer. Suggested Souvenir: Do your best millennial impersonation with a banana-yellow LIB slingbag ($30) or dress appropriately for Wilco in an aquamarine “dad” hat ($35).